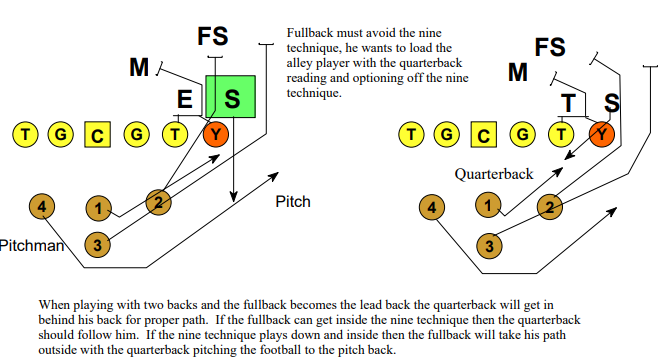 In example number 1, you see the load option being run at a five and nine combination or a 13 tight defensive front. This defense is a good situation for 18 or 19 Load option because of the trey combination between the tackle and tight end. By being able to block down with the tackle and tight end you can restrict the flow of the linebackers and the play will never stretch thus, giving you more grass to run on outside. 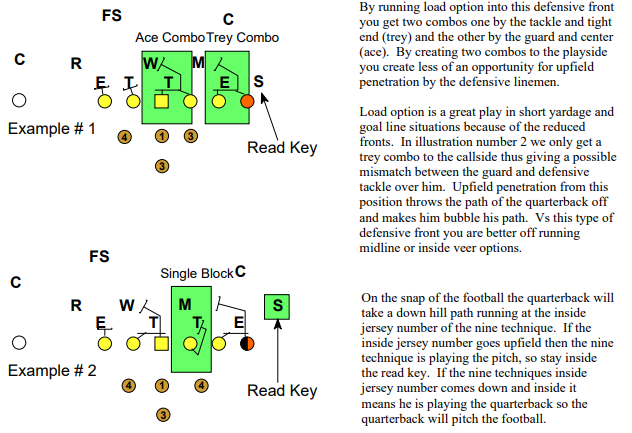 complements the midline and inside veer schemes when defenses start to reduce in order to defend these two options. 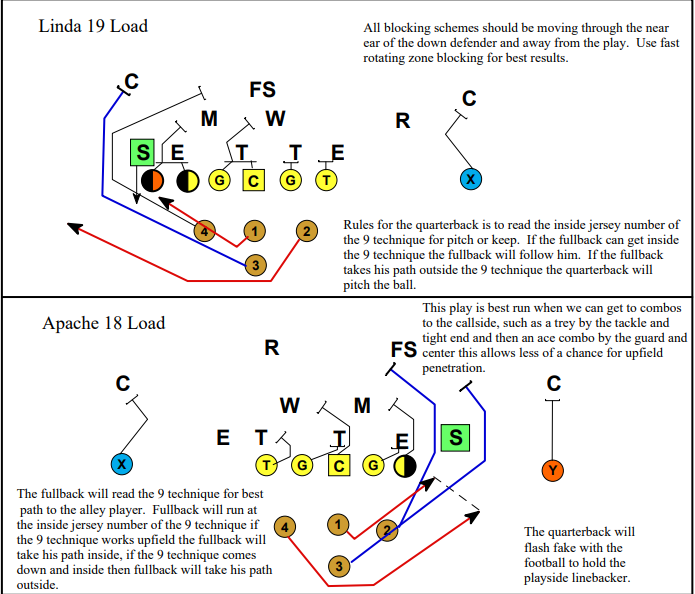 Whenever a defense reduces it starts to remove players from the perimeter thus, setting up the 18 – 19 option schemes. As the load option is taught to our players they learn that whenever the load scheme is used it tells the offensive linemen to fast zone their blocking schemes, this means to bring their hips and feet around fast to compensate for fast flowing linebackers scraping to the play. The following information will give you the needed information for our quarterback mechanics. Our quarterback upon receiving the snap from center will step with his backside foot at a 45 degree angle, which sets up his pitch relationship for a possible quick pitch with his pitch back. The quarterback’s second step is with his playside foot stepping back at a 45 degree angle until both feet are underneath the quarterback once again. The third step by the quarterback is with his inside foot, stepping downhill at the read defender or nine technique. As with the other options mentioned previously the quarterback must stay downhill with his path. Quarterback on his third step should flash the football back as if to hand the ball off to hold the linebackers inside, this helps to set the combination blocks up and helps the trey and or duece combos to wall the playside linebacker off. quarterback and the pitchman. The thumb should stay pointed down at the ground which keeps the quarterback from drifting towards the pitchman. When screwing the thumb to the ground technique is incorporated into you quarterback mechanics it will keep the pitch defender from slow playing the double option. By stepping the quarterback off the line of scrimmage at a 45 degree angle with the backside foot will help in getting your pitchman in a faster pitch relationship with his quarterback. When running load or speed option into the openside the perimeter has been shorten thus, giving the pitch defender a shorter line to the quarterback if he decides to take the quarterback as his option responsibility.